It is quite mesmerising to watch but also quite therapeutic, especially if you block out the knowledge that the next fabulous tight curl of winds, all squashed together in a funnel, might bring on the sea-sickness again! I have done many, many video-sessions to schools, colleges and other groups over the last 8 weeks. I always show them this interactive map depicting wind direction and intensity, which is calculated to make the audience think about the technological challenges of deep-sea drilling operations, and the skill and experience required to carry out the practical operations upon which the scientists are totally dependent. The commonest question following this map exhibit is, “How do you keep the ship steady in those conditions?” This, of course, is a vitally important question because too much movement can cause damage to the drilling equipment or even the ship itself. The first control we have is the expertise of the captain and his crew! They set the ship pointing into the major axis of wind and waves, which are not always perfectly aligned and have the horrible habit of constantly moving, and have to be constantly monitored and the ship adjusted accordingly! Then the main way of controlling the ship’s horizontal movement is by a series of ‘thrusters’. Drilling ships are specially adapted with laterally directed propellers. The JR has 10 retractable ones and 2 fixed ones. They are all connected via a complex computer system that is guided by GPS signals. If the ship senses that it is moving too far one way or another from the GPS pinpointed site, the thrusters will automatically switch on and off in order to push back against the prevailing wind and wave direction in order to maintain position. It is this thruster noise, switching on and off during the night, that has kept me awake on many occasions! It is only blocked out by the use of heavy-duty earplugs! However, in high seas there is also the problem of vertical movement to consider, known as ‘heave’. This is countered by the hydraulic heave compensator installed high up in the rig. The drilling pipe is rotated from the bottom of this large piece of machinery, which slides up and down on rails by the use of hydraulic rams, to keep the drill head, as far as possible, in contact with the bottom of the drill hole. If the drill head started to bounce up and down against the bottom of the hole it would damage the drill hole, the drill pipe and the drill head itself! The heave compensator can cope with wave heights of 15 feet (4.57m), beyond which the drill head will be pulled up the hole, away from the base, until the wave height has subsided. This has only happened once on this trip, and while we went through another storm last night it was just within the drilling limits so we are still just about on target to pull out our last core today! 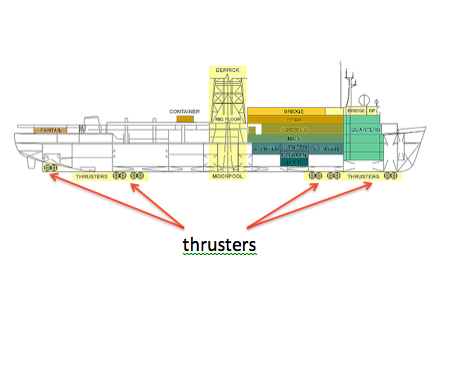 You can see just how hard the thrusters have to work sometimes by looking over the side of the ship in rough weather. Where the water is pushed out sideways by the propeller blades, it hurtles up to the surface in a series of expanding pockets that smooth out the surface as they force back the encroaching waves. This produces an apparently ‘still’ pool of water alongside the ship as the incoming and outgoing water movement cancel each other out, with a glassy-surfaced area fading into the choppiness of the open sea beyond. While we cannot control our vertical movement – only deal with the consequences of it, the thruster controls are so good at controlling out horizontal stability, that we can stay within just a few metres of our GPS site. As always, it is a combination of human skill and technological applications that help us to research and understand our world.